My favorite dessert, hands down, is chocolate covered strawberries. Really anything covered in chocolate is pretty divine, but the strawberries give the illusion that you’re eating something somewhat heathy. ? A few years ago, I made these chocolate covered strawberry hearts for Valentine’s Day. I wanted to figure out a way to incorporate those ingredients into my life once again, but with a new spin. 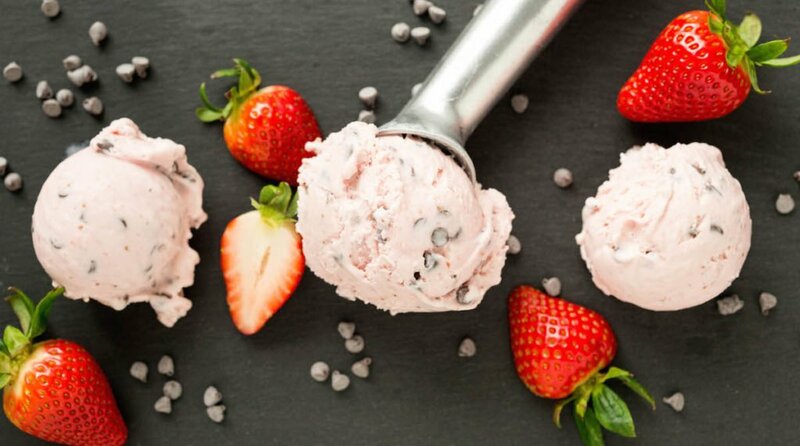 Enter Strawberry Chocolate Chip Gelato….talk about melt in your mouth goodness! This was my first attempt at making gelato and I have to say, it couldn’t have gone better! It is so simple to make. Not too many ingredients or steps. Why gelato instead of ice cream you say?! I love how soft and silky gelato can get compared to ice cream. When making gelato more milk and less cream is used and usually no eggs in comparison to ice cream. You can use any ice cream maker to make gelato. I use this simple one. 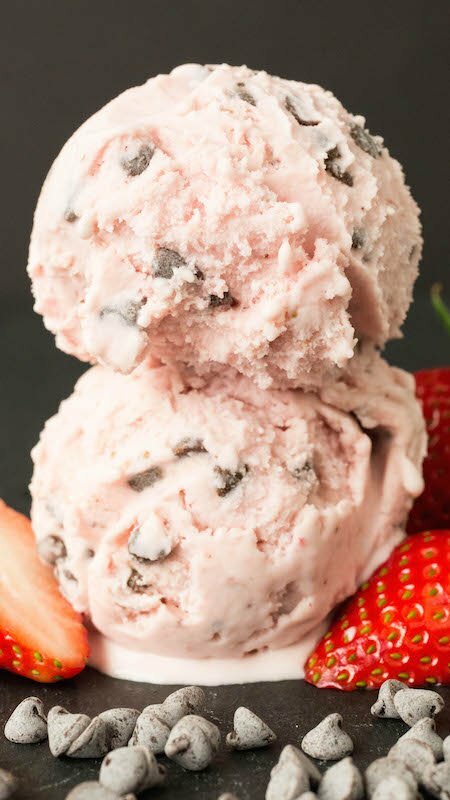 Using fresh strawberries gives this gelato such a sweet and fruity taste and those little bits of chocolate accent it very well. In a medium sized saucepan, whisk together milk, cream, powdered sugar, and cornstarch. Place the pan over medium heat and continue to whisk constantly for 7-10 min, or until the mixture bubbles and thickens. Remove mixture from heat and whisk in vanilla. Pour mixture into a bowl and cool completely (I put plastic wrap on the surface of the mixture for 2 hours until mixture was cool to the touch). While mixture is cooling, purée the strawberries in a blender or food processor until smooth. After the gelato mixture has cooled, put the purée through a strainer and fold into the mixture (getting rid of as many seeds as possible). Put the now strawberry gelato mixture back into the refrigerator (once again with plastic wrap on the surface) for another 3 hours. Use your ice cream maker to turn the mixture into gelato. I left the mixture churn for 10 min. Add the mini chocolate chips for the last 5 min of churning OR once you have spooned the gelato into a freezer safe container fold them in. Freeze gelato for at least 2 hours before serving. Sounds very yummy. I was wondering if using strawberry rhubarb jam would work just as well as the strawberry purée?